In any given home you are sure to find a chest of drawers. Whether you call it storage furniture, a dresser or a vintage desk like our friends from across the pond, this extremely functional piece of furniture has been made and invented for storage purposes, regardless of what people have been storing within it throughout the years. 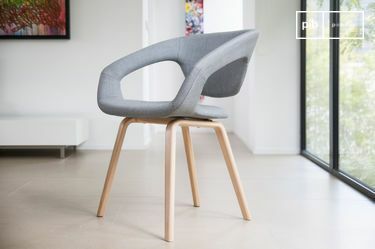 This household item has been reinvented and designed to adapt to various interiors and uses since it was first created. Whether it has been transformed into a chifforobe, which is a combination of a wardrobe and a chest of drawers, or simply given different proportions to store more or less items, or has been converted into a Welsh dresser, which has shelves used to store tableware, the chest of drawers is has and always will be used for the storage of numerous items. Traditionally this commonly used piece has been used to store clothing, in particular underwear and socks, amongst other clothing items that would not be hanged in a closet. This has led to the chest of drawers regularly being placed in the bedroom. Eventually the chest of drawers became known to be used for all different kinds of clothing that could be placed within it and didn?t have the need to be wrinkle free for work in more professional settings, such as suits or dresses. Most typical chest of drawers have been made with a rectangular shape that has four feet to keep it off of the floor. In the past this furnishing was made with 5, 6, and 7 drawer variants with a single or double drawer, most notably found at the top. 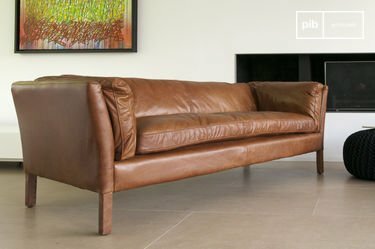 This piece is commonly made out of wood but has been constructed with metals as well for use within industrial environments such as factories and workshops. A furnishing of this substantial size is usually placed against a wall or positioned in the corner of a room. 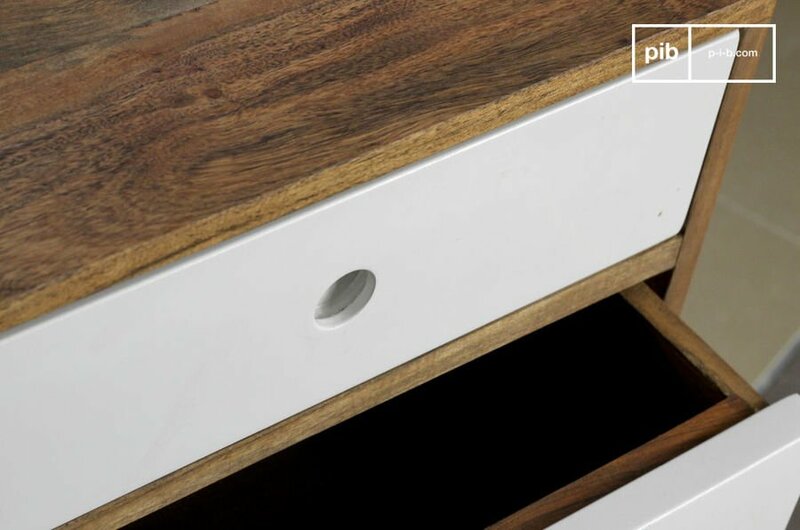 Throughout the many eras of design that have become dominant influences in the world of furniture manufacturing, the chest of drawers has most definitely been adapted to reflect these different periods. For example, possibly the most notably seen design style to garnish a chest of drawers is the art nouveau style, which produced typically rounded vine like ornamental details that were carved Into the wood itself. 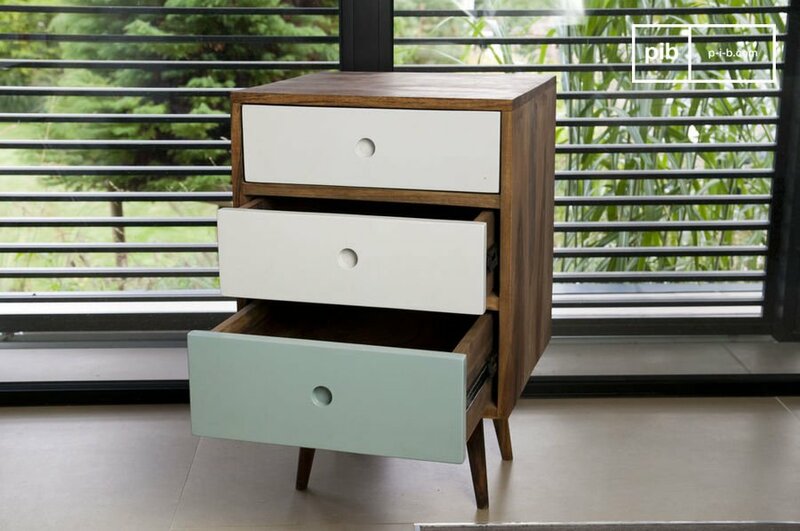 When it comes to height chests of drawers usually come in three different standard heights, the first being waist high followed by bench high chests and lastly shoulder height chests. All of these adaptations have a table space that can be used for accessories, in most instances the waist and chest height versions are accompanied by mirrors. These mirrors have been known to be connected as a second piece to the back of the chest of drawers, which turns it into an adapted dressing table. Like most of other pieces of furniture the chest of drawers first began to be widely used during the medieval times in Europe, within the homes of nobles. As it once was known the ?coffer? was a simple wooden box with a hinged lid that could have been made with or without feet. The ?coffer? eventually became to take the form of what we know of today as a chest of drawers when the drawers began to be added to the furnishing. Just like most pieces of furniture in this period, the chest of drawers was made out of oak. This piece eventually was made out of French walnut, and a few of these pieces have managed to survive until today. This has come to be a commonly used piece that most people have in their home. 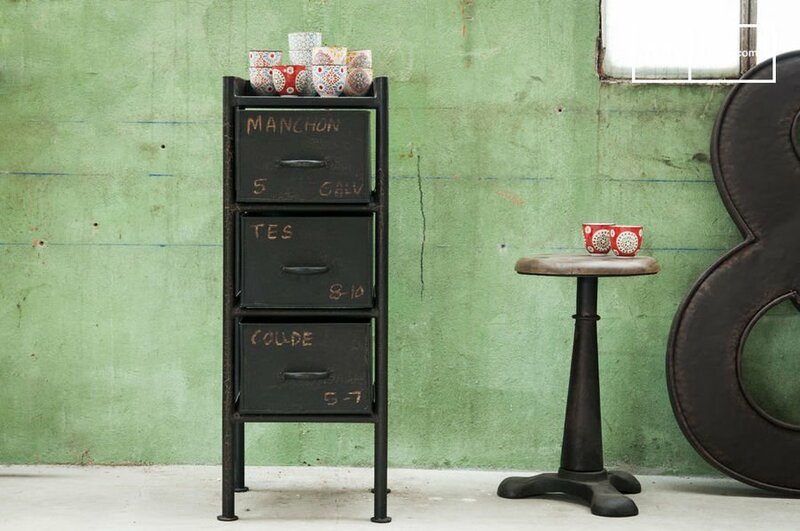 Although the chest of drawers was frequently made out of wood, industrial versions made out of metal were also made to cater for industrial environments like factories and workshops. Today both antique wood, and metal pieces have been refurbished and refinished and sold as a vintage chest of drawers. These vintage pieces have been retreated in numerous ways that have allowed them to have a second life in a new home. 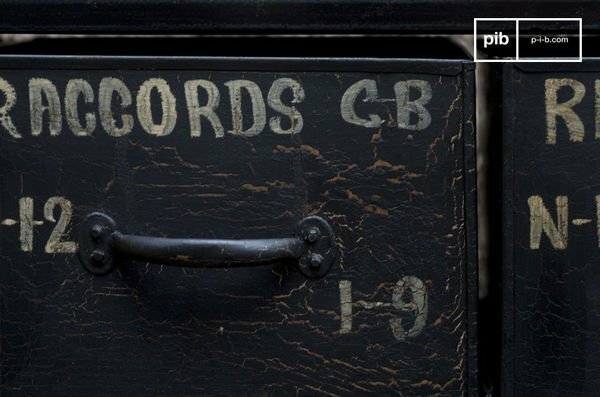 Popular techniques such as wallpapering, and painting over a vintage chest of drawers have become the standard for vintage pieces. They have also become versatile in their function, more recently waist high chests of drawers have been used as consoles in entrance ways or hallways and have been typically accompanied by mirrors or paintings to cover the empty space above it. 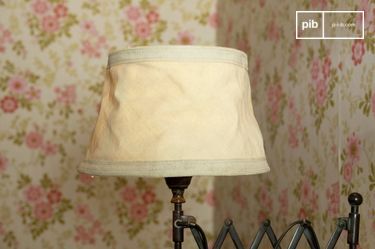 The search for a vintage chest of drawers can become a DIY project which leads you to an antique store and ends with applying a varnish, wallpaper or paint to refinish a vintage chest of drawers to your liking. Of course these vintage pieces can be made on your own or can be purchased by professionals and manufacturers who make it their job to hunt for used pieces and recycle them and in turn refurbish them to be sold again as a vintage chest of drawers. This clearly takes away the hassle that most people go through to create their own vintage chest of drawers. Of course this may be the experience you are looking for, in this case start your search in antique stores and of course second hand stores where you can find damaged or distressed pieces at a much lower cost, but need a little more work. If you?re looking for a chest of drawers to fit in with your industrial décor you may be interested in a metal version that can accompany the rest of your interior. Whether you?re after a large shoulder height chest or waist height drawers and even smaller types that can be used a side table or bedside table for your bed, there are endless styles and variants that are available to complete the vintage industrial furniture look. 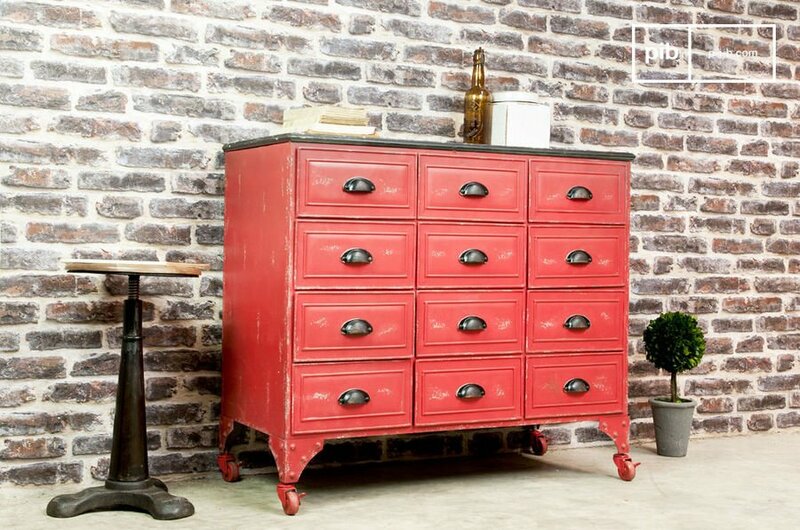 The most common piece of vintage industrial furniture is possibly the chest of drawers. With the most popular industrial version being the metal made piece that has the appearance of a workshop furnishing used to store tools and blueprints. These industrially styled chests have been given in most cases a patina finish that has been given to the furnishing by applying multiple layers of paint that have been worn and distressed both naturally, by the effects of oxidization and exposure to sun, and artificially with the use of tools such as sandpaper. Aside from the all metal pieces, there are also metal and wood chests of drawers that add a natural touch to the metal piece. Incorporating a vintage chest of drawers in your vintage industrial furniture décor is a great idea and could complete the overall look by adding an industrial focal point that can be accented by eclectic accessories and pieces to bring the room together. A smaller width and height sized industrial chest would be beautifully placed next to a bed as a bedside table or as an end table on either side of a dark leather sofa. Not only would this provide a nice place for a lamp and other accessories but it would be a great storage addition for many little objects and items that would be otherwise left on a crowded coffee table. As mentioned before a waist high chest of drawers with a regular width would be a great addition to a vintage industrial styled entrance way or hallway, underneath a mirror or painting. For a vintage industrial furniture look, an old movie poster or framed antique blueprints would look great and complete the industrial look you?re looking for. The most conventional use of a chest of drawers would be in a bedroom, where it would be used a place for folded clothing. 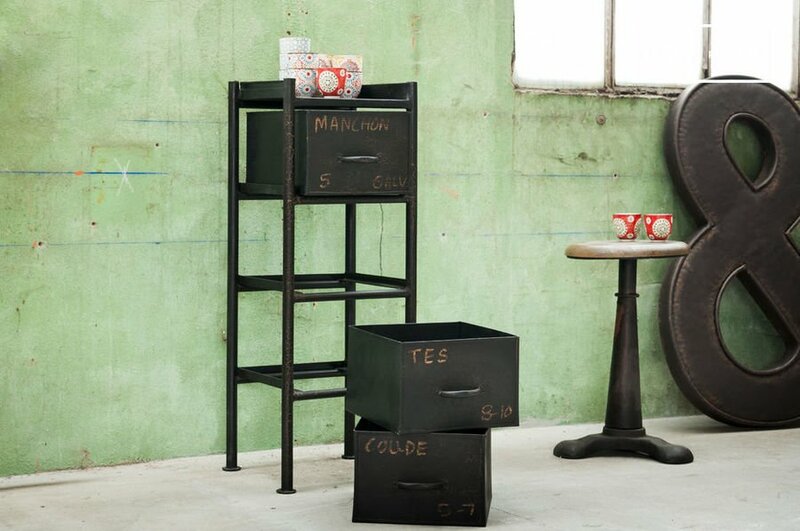 In this case an industrial chest of drawers made out of both metal and wood would bring an industrial aspect to your bedroom that wouldn?t be too harsh in appearance for a cosy bedroom. 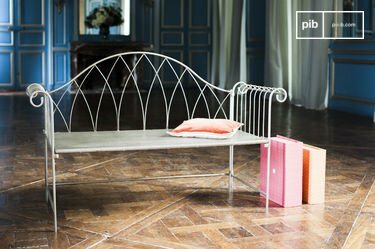 This could be wonderfully accompanied by the smaller chest of drawers mentioned before that would look great beside a bed. 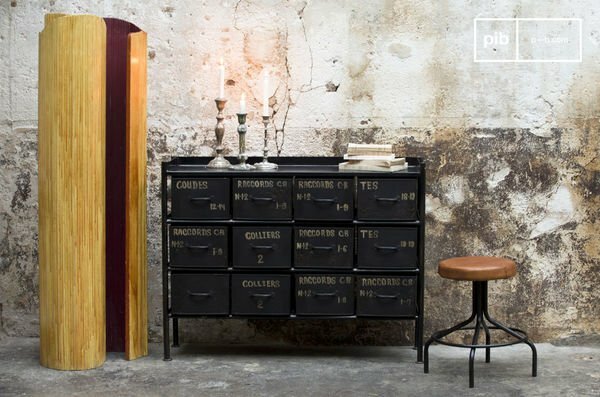 One place where a vintage chest of drawers would work wonderfully with a vintage industrial furniture décor would be an industrially styled office. It could be accompanied by a metal and wood industrial desk and industrial chairs and armchairs, that would bring together a truly industrial décor. An extremely industrial style of chest made entirely of metal that has a beautiful dark patina would be a great place to organize documents and place any tools and items commonly used in an office setting. With the mind of an interior designer, an industrial sideboard could be incorporated into any room with ease.